With the advent of whole slide scanner and digitization of pathology workflow, the volume of digital images has skyrocketed, making way for new and niche machine learning algorithms. 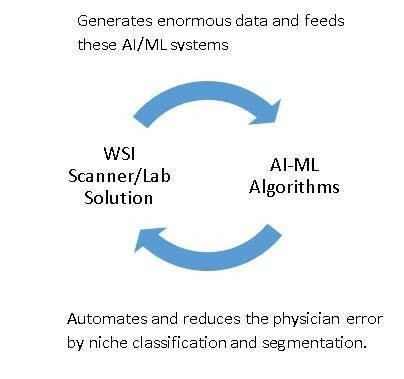 These new machine learning algorithms in turn, are providing a large volume of improvements to current pathology workflow, thus accelerating the process and adoption of digitization. There is an inter-locked value chain established complementing each other. Availability – Gathering data from disparate systems for research and other activities still takes a good amount of time and effort. In most cases it requires large IT infrastructure to support it, and most systems are not ready with seamless integration either. Data-Privacy Checks – Data privacy and other regulatory requirements are still big factors while data sharing. Most systems are not ready for any post-consent mechanism or implementing newer rules for data privacy. Hence data sharing becomes more rigid. Affordability – In general, AI algorithms require a huge amount of non-siloed data in order to be productive. It is generally not affordable for crowd sourced projects to bring all these data together from different systems and geographies. Blockchain is a digital ledger; a connected list of secure and immutable transactions. It’s achieved by distributing the data on different nodes (computers or servers), and it uses cryptographic techniques to connect them all, making a chain of linked and immutable ledgers. Smart contracts are pieces of computer code that run and define rules for any transactions on blockchain. They are self-verifying and self-executing, which makes them effectively remove the need for any middleman or intermediate for different types of transaction. 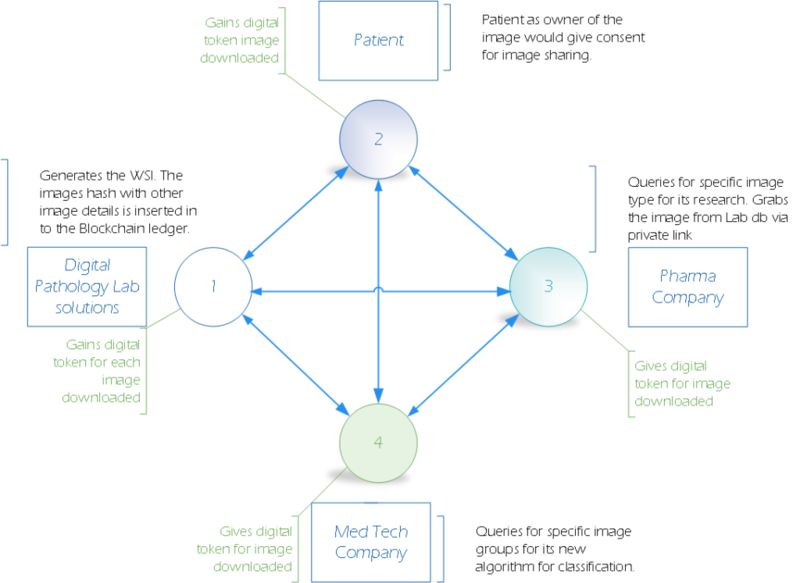 What does using that Blockchain system look like in a Digital Pathology use case? Consider 4 nodes from different stakeholders participating in the proposed Blockchain system. (1) Lab Solutions participating in this solution will add a ledger entry with meta-data (image hash, other image information), when an image/report is generated. Hence, every image generation from every participating WSI in recorded into this system. At event of this transaction (when create image is added to the Blockchain system), using smart contract the system could add some electronic logic to release some digital tokens to WSI systems account. (2) Participating patients could digitally give their consent to use their anonymous data for research activities. They could even take back their consent when they feel to do so. These are recorded in immutable ledgers for the lifecycle of the image. At event of this transaction (when patient provides access to their image), using smart contract the system could release some digital tokens to patients account. (3, 4) Participating med-tech/research companies could query a very specific patient shared data from different geographies in a small time frame and get started with their research activity. At event of this transaction (when image is accessed and downloaded), using smart contract the system could seek some digital tokens from the med-tech/research companies to its account. What are the value adds of Blockchain? Creates value-based chain with different stakeholders, where everyone complements each other’s function. It’s win-win situation for all participating entries. 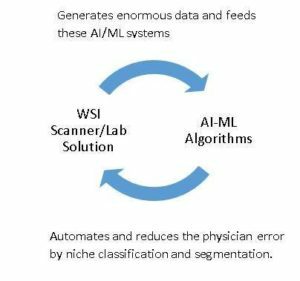 Accelerates the use of digital pathology (WSI systems), by bringing in new and innovative machine learning algorithms to current workflow in a faster pace. Support and aid tele-pathology use cases by sharing data and building referral system for an expert opinion across geographies. Brings different vendor image modalities into a common framework. Immutable ledgers would safeguard the ownership and track usage of the image from the time of its creation. Provides patients or end users the ability to control their data (by means of the consent mechanism of Blockchain) and get rewarded with digital tokens. The outburst of machine learning disruption we see today has been contributed toward in large parts from supervised learning environments. To make an evolved, truly intelligent application we need large amounts of data. Decentralization of data from the current paradigm will aid machine learning disruptions in these area. Blockchain will act as a catalyst to establish this vicious chain for Digital Transformation and AI. If AI is going to be the electricity (borrowed from Mr. Andrew Ng), that is set to change every industry in near future, then “Blockchain will be the coal”. Blockchain will be fuel for the future Artificial Intelligence (Singularity) era. “A collaborative, connected, confidential (secure) platform is key to the success of Digital Pathology. “ And Blockchain could play an important role in achieving this for current Digital Pathology workflows. Disclaimer: These are views of the author under his personal capacity. It is not sourced with any commercial interest or third party entity. Great article. Blockchain has the potential to revolutionize not only Pathology, but medical research in general and many other things. I am looking forward to these advances. There are so many places and areas within pathology, which would benefit. Thank you for the article!